If life were a melody, would we sing the song of ourselves throughout it? And what if it became clear that we were singing the wrong song? resonance. But what if our lives were about recognising and building on our own melody, what if we all had the same possibility to sing for ourselves, the most beautiful song possible? Ah. That song may last a long time, it may not. We may be only able to sustain it for the shortest time. We may be able to sing the best song we can for ourselves for our whole lifetime. We may never get to sing our perfect song at all. The song we sing of ourselves, is about who we are and what we are doing. If we become too used to it, this song, we forget we are singing it, we sink into habit and sing the words without remembering what they are or what they mean. If we feel wistful, envious and doubtful, then perhaps our song is not the right one. Perhaps it was right once, and now needs changing. Perhaps we need new notes, new words, new meanings. I wonder if we have just the one song each, a theme song all of our own, which we sing throughout our lives, that has parts and harmonies and notes and lyrics both added and taken away as the years pass. We join our song with other people, and maybe stay a while, a lifetime, or leave. Our singing jars with certain songs, harmonises with others. Louder music drowns out what we are singing, and we sing loudly over other quieter songs. Imagine if we all were singing the song of who we are, and what we are doing, and we could no longer hear ourselves. Or each other. Or, imagine if we could. Imagine if I could hear and understand your song, and listened to it with delight. Imagine if I had heard your song for many years and suddenly you were singing a beautiful new one. I would be thrilled, and maybe my song would adapt to harmonise with yours, and we would sing alongside each other, for as long as we needed. Imagine if my song were becoming slow and difficult to understand. I couldn't remember how to sing of who I am and the part that describes what I am doing was becoming less and less distinct. Imagine if my song was becoming discordant and clashing with other songs, imagine if it was becoming quieter and quieter, and becoming drowned out by confident and louder songs around it. I would need to understand why I was no longer able to sing as before, and then create a new song. A new way of bringing back the words I had lost, of describing who I was, so that they once more sang of my truth and my heart and my soul. The last few months have been about change for me, and I have found it difficult to see where I was going with my work and my life. I couldn't see what I had already done, and what I wanted to do next. And then, the idea came that I was singing the wrong song. All I had to do to make sense of things was to sing the right song. It felt easier to see my work and my plans as a song, it made sense to me in a way that writing lists and analysing had not done. The song I had been singing of A Graceful Death, of its progress so far, had been sung, it had come to a gentle and natural end. A new version of my song now needed to be formed, a new melody found, and a cautious new song of who I am and what I do next begun. All I need to do, is sing a new song of a new adventure, make up the words of my next stage of who I am, and find a tune that resonates with all that I have learned and experienced so far. The pleasure of seeing my difficulties of direction symbolised as music and my part in it simply to find another way to sing of who I am and what I want, has made a huge difference to how I feel about myself. My new song is forming and describes a journey I have always been about to take. My new song sings of being strong, taking risks, and letting go of what holds me back. My new song is gentle and powerful and can be heard simply without too many notes, by those who need to hear it, and this new melody is about being older and wiser and a little less seen. It is about being brave and moving on, giving A Graceful Death a whole new song too, continuing to be sung as ever, lovingly, alongside mine. So on that note, I shall end. The song my sons are singing is one of hunger, and I shall go and sing the song of sausages and spicy cous cous. Then I shall hum happily in the bath and sing aloud to a nice uncomplicated detective novel. It is all making sense. My song here is the tap tap tap of the laptop while Alan sits opposite me in the sitting room. 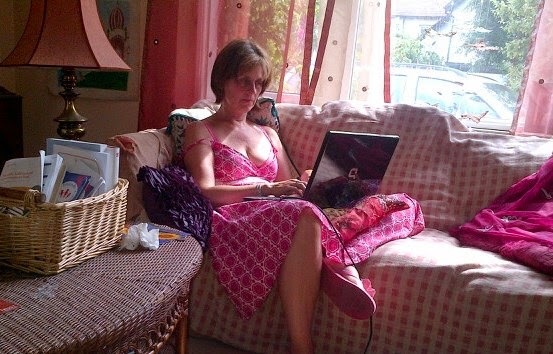 This is me writing this blog, and yes, that is a new pink dress, and yes, it is singing the right song for me. Giant Boy asked me to shave his head yesterday. Absolutely not, I said, and we settled for a short back and sides that made him look like a sinister Russian soldier from 1945. His hair did need cutting, and I agreed that something needed to be done. But shaving his head makes him look unrecognisably awful and very dangerous. As he is my baby, I can't have that. So, he has shaved-ish back and sides and a nice flop of hair on top. Looking like a sinister Russian soldier from 1945 will have to do. Besides, we are going to Grandma's today, and she, at 84, doesn't mince her words and has the right to put him in a cupboard for the visit. 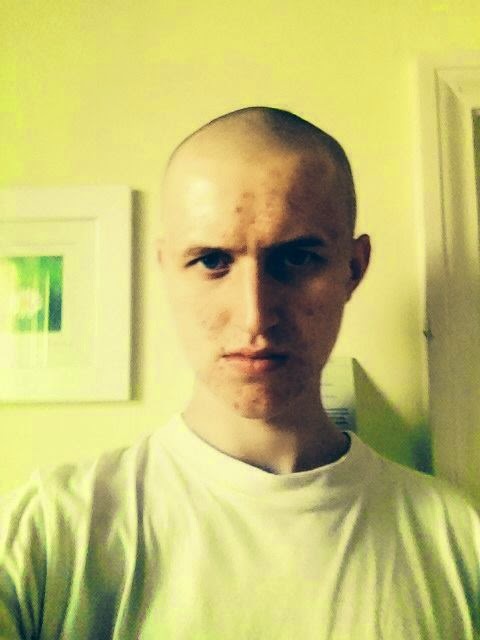 We didn't go for this look this time, the shaven psycho look. Grandma will identify with the hair still on the top of his head, and I am happy, a win win situation. Older Son is back home. He is passing through, looking for a place to rent in Manchester, from Bognor, with the intention to try his fortune up North. It is lovely to see him, but one more chaotic body in this home makes a big difference to space. His clothes are in each room, under the stairs, in the garage and in the studio. It's not much fun being so fragmented. He is sleeping on the floor on a blow up mattress between the piano and the sofa in my sitting room, and sleeps fully clothed because he is young and alternative and doesn't care. I remember doing that too, when I was 21. I used to sleep in my clothes and have pink hair and write and draw all over my walls when I was at University. I also had a bath once a week in the Student Union; the tenements where we lived didn't have bathrooms and the toilets were outside and often, it being Aberdeen, frozen solid. I believe, if I were to meet me now, I would have me fumigated. First one held last week, chatting over dying to waffles and coffee. How it should be. We did it, we held it in a Waffle cafe. It was small, it was the first one. Apart from Val from Community Organisers and me, we were joined by some local Bognor friends who took the time to come and support us. Giant Boy turned up, bless, and we were happy to include two ladies who we didn't know. Keeping the talk on track was difficult, it was very easy to simply chat about all sorts of other things. This is something I need to learn how to do. I was delighted with the event, and am following up the New Park Community Centre in Chichester to hold one there. Each time I do it, I will learn how to make it work. I am also meeting with a Salvation Army man in a local community centre here in Bognor next week, to see if we can set one up there. I am meeting with my dear friend Mandy Preece on Wednesday, in Bournemouth. Mandy is a Home Funeral Celebrant and Soul Midwife, she is the business. She and Cannon John Hyde of TESSAC (The Province of the Ecumenical Society of St Augustine of Canterbury) are holding an event in which the A Graceful Death exhibition will feature. This is good. Mike Hardy, who I painted for the exhibition, has not been able to come to see himself on film or painting in any of the exhibitions as his Motor Neurone Disease has prevented him. All my AGD exhibitions have been too far away or in places inaccessible for wheelchairs. In Bournemouth, there will be a chance he can come and take part. I am very hopeful, I would love to see him and his wife at the exhibition. On the 27th and 28th of September, AGD will be going to Ascot to join a festival called Resilience and Self Empowerment in a Time of Transition. It is run by a group called Ascent, and will be held at the All Saints Church Hall, London Rd, Ascot SL5 8DQ. AGD will be muscling in there under the banner of Resilience, the rest of the festival is about conservation and climate change. I shall do my bit, and AGD will stand tall for climate change. And dying. At the end of November, I hope to go to Swansea with Kiera Jones and Jim fox of The Centre fame. Jim and Kiera have set up this amazing Centre in February 2011 in Swansea. It provides complementary therapies for those living with cancer and other life limiting illnesses free of charge. Keira is a palliative care nurse and Soul Midwife, and is a most loving, strong and amazing lady. Jim and Kiera are gentle, modest, movers and shakers, they put themselves out to help others, and if I do go up there to do an AGD event, I am honoured to be associated with them. Here are two paintings just finished for two baby boys, found abandoned in Ethiopia a few months ago. These little treasures have been adopted into this country, and are being christened today, for which these pictures were commissioned. The little fellow on the left likes watching the leaves in the breeze, and the little fellow on the right loves drums. Both have Ethiopian angels to watch over them. They say that change is difficult. Goddamn right it is. I am moving on to a bigger more focused vision of using the A Graceful Death exhibition and projects, which is easy to say (write) but what the hell does it mean? Quite. When I was painting in the exhibition, that was my job. It was hard, it was moving but it was strong with a painting and interview at the end of it. I made the right decision to stop painting for the exhibition, it is big enough, and I need to move on and out into the community more. But I am not sure what to do and how to do it. Eeek, I say. However, despite feeling as flotsam upon the heaving sea of life, I am a tough old boot and will sort all this out in time. I have followed some excellent advice from my old pal Jane, and have a large notebook in which to write all my thoughts and plans willy nilly, in order to make sense of them later. And so on. I think I long for a quiet life where I am unencumbered by domestic duties. And I have staff. And everyone does things for me. All the time. I did go to Misty in Roots in Brighton though, this week. My daughter Fancy Girl and her boyfriend took me as a treat. So I do have fun times. I have not seen Misty play since 1981 and so this was a big deal. They are elderly like me now. Wonderful. Lizzie Hornby, musician, teacher, friend and Unitarian preacher, called last week and said that in return for clearing up her cottage a bit with a hoover and a duster, I could have it for a month. "I'm off!" she said, "to America and Canada, touring with my music." "Is the Pope a Catholic?" I replied, and so here I am in Dorset, hidden away in rural cottage heaven, with permission to eat all Lizzie's food (I have finished all Eileen's food from last week, a pattern is emerging) in return for hoovering. I will more than hoover. I will have her cottage marble clad and have Corinthian pillars installed. Inside this cottage, someone is eating cashew nut butter with a spoon. Cashew nut butter that belongs to someone else. Eating food belonging to other people is becoming a habit. It has been a good week and I am much less tired. I have been doing a spot of thinking and this is what I have come up with. I am always like this (tired, dispirited, lost, hungry, annoyed, stunned) after a big exhibition. Always. The tiredness is not just physical, it is emotional, mental and spiritual. This is true for most of us, it is important. It is also important to know that it is very hard to recognise, and we need to spend time on recognising what is happening. If I get too overwhelmed and tired, I talk utter rubbish. Difficult to believe of course, but the proof is in the startled expressions of the people I am talking to, and the way my mother phones and says I need sectioning. Not really, she just says I need some early nights and to get a grip. Just because I don't know what I am doing doesn't mean I am not good at it. Whatever it is. It takes a long time, and lots of will power, to really stop and recover. Like driving a car very fast and suddenly putting on the brakes, you are no longer driving but the car is still pelting forwards and it all gets very stressful. Stopping the car and making the decision to get out so you are no longer driving and, are no longer in the car, is blindingly obvious after you have done the other braking at top speed thing. Life is bigger than you think and surprises are always around the corner, and when you stop and surrender, that surrender is the thing that releases you to recognise those surprises (nice ones in this context) as they saunter round the corner and into your arms. And so, here I am in Lizzie's cottage. I have eaten her oat cakes and jam, and have had a pot of tea. I know where the cashew nut butter is and have noted the price sticker on it. I will build up to eating that (with a spoon, from bed, at midday). This, though, is a whistle stop visit, I am away again tomorrow and if all goes well, I will be back in a week with my painting things to paint this month's commission. Alleluia. Christening portraits each for two angelic Ethiopian babies who have been adopted into this country after having been abandoned at birth in their own. Think bright colours, said the commissioner. That will be difficult I quipped. 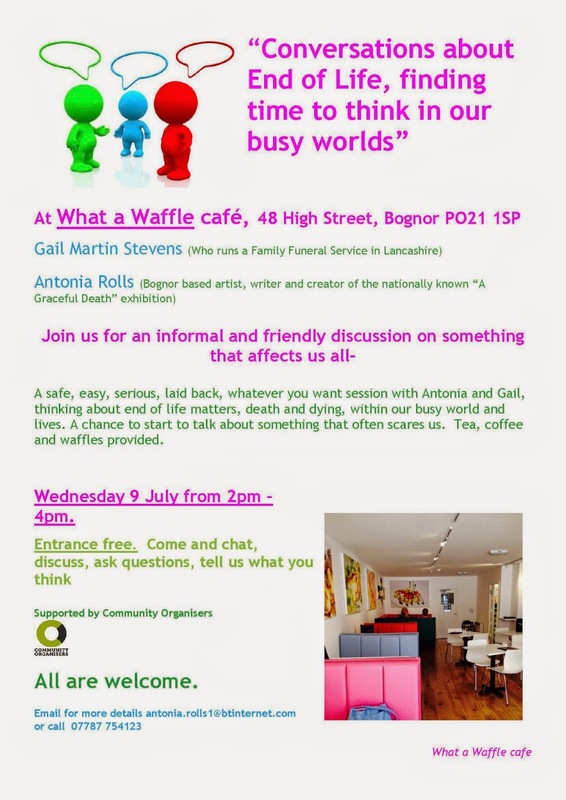 On Wednesday I am holding my Conversations in Bognor. Sadly Gail Willington cannot make it this time, due to pressure of work, and though I will miss her, I will carry on regardless. Perhaps I will pretend she is there and keep addressing an empty space until someone asks what I am doing. "Have you met Gail?" I will say, gesturing to the empty space with a waffle on a plate, untouched, on the table in front of it. I expect I will be asked to go back to Lizzie's cottage as quickly as possible and stay there. All are welcome, please come and join in. Waffles and coffee or tea provided. It's worth talking about death to get a free waffle, isn't it? There was a wonderful response in Chichester to these Conversations. I asked the New Park Community Centre if I could leave some leaflets in the cafe. No was the answer. Too many people leaving too many leaflets in the Centre as the Chichester Festival is now running gets out of hand. But, on looking at the poster, the Manager asked me to go to her office to talk about putting one on there at the Centre. "We do not allow ourselves to talk about this," she said, "we would welcome you doing a Conversations here at New Park, please let me know". I took between a quarter of a second and half a second to say Yes and so, I will set that up after this one on Wednesday is over. What a wonderful manager of New Park Community Centre. I am happy to have with me here in Dorset the one and only Mr Bedford. He is in Lizzie's sitting room next door, in both agony and ecstasy, I can hear him through the door suffering badly watching the Men's Finals at Wimbledon on his laptop, identifying deeply with each move, each sigh, each move made on court as two giants of tennis slug it out for the Champion's cup. For Mr Bedford, this kind of thing is personal. As a sportsman himself, (ex American Football) and as a devoted tennis player now, he is on there, on the court, and lost in the experience. The Grand Prix racing was on just before the tennis, and that was very tense too. I think he won that, so he was in a good position to take on the tennis afterwards. Mr Bedford is being helped to get through the match with a packet of Licorice Allsorts, a bag of crisps and a bottle of diet coke. Here he is, Allsort poised half way to his mouth, playing tennis in spirit at Wimbledon Men's Finals. I am next door, with a pot of tea, a laptop, oatcakes and jam and a growing obsession with the cashew nut butter which I know is in the cupboard and I need it. Together, and separate, we are happy in our own worlds, together in spirit and understanding, and separate in different rooms doing different things and eating different foods. The tennis is over! Mr Bedford has lost! He has gone off in the car to find food for dinner tonight, and I am finishing this blog. When he comes back we shall sit together in the garden and feel the peace that comes from a job well done. He played as well as he could, Mr Bedford and Roger Federer, and I have written my weekly blog despite wanting to raid Lizzie's larder. We shall spend the evening in happy peaceful companionship, and in the spirit of surrender and letting go of tension and tiredness, tomorrow is another day. Aaaaah.